OML 62 is located in the swamp area of the central Niger Delta. 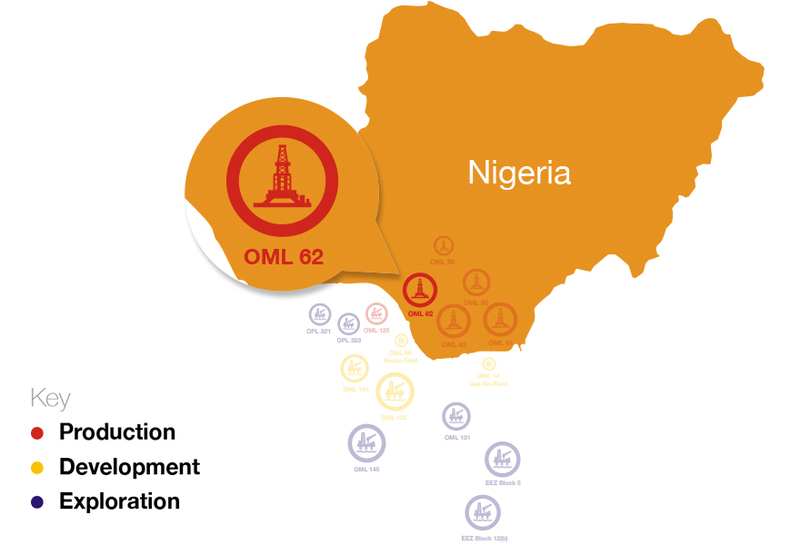 OML 62 covers an area of 1,221 km² (301,715 acres) and is mostly located onshore, though the western extremity of the License extends offshore (about 8 km). Exploration in OML 62 began with the discovery of the Odimodi gas field in 1967. Successful exploration continued in OML 62 with the discovery of the Tuomo field in 1972 and the Beniboye field in 1978. To date, the License comprises one producing (Beniboye), two undeveloped (Tuomo and Tuomo West) fields, four “drill ready” prospects and a number of leads. Oil from the Beniboye field has a gravity of approximately 20° API for the shallow reservoirs and 42° API for the deeper reservoirs. 10 inch oil export pipeline from the Beniboye flowstation to the Forcados Terminal.